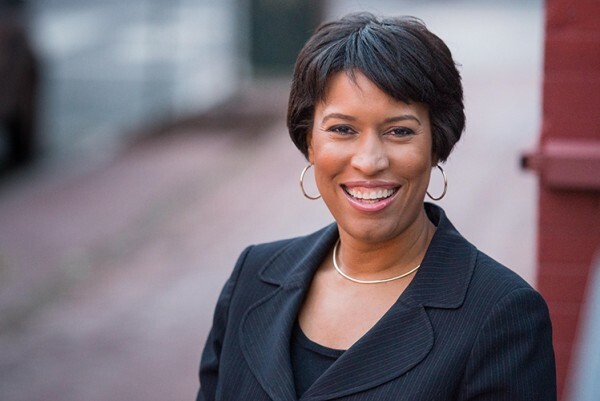 Mayor Muriel Bowser will attend the monthly meeting of the LeDroit Park Civic Association. Join us at the meeting tomorrow, Tuesday, February 24 at 7pm at the Florida Avenue Baptist Church (623 Florida Ave NW – enter at the back). 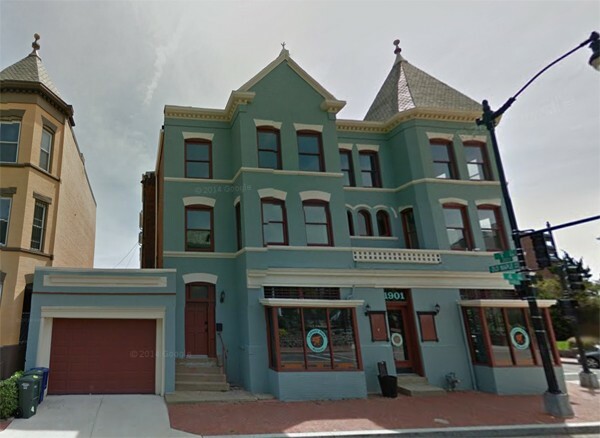 The Association will also vote on whether to oppose the application to build a roof deck and exterior stair at 1901 4th St NW. A few months ago I stumbled on this fountain, the Lowell Memorial Fountain, in New York’s Bryant Park. Something looked familiar about it. It turns out it was designed by Charles A. Platt, who designed the McMillan Fountain that once stood at the McMillan Reservoir. 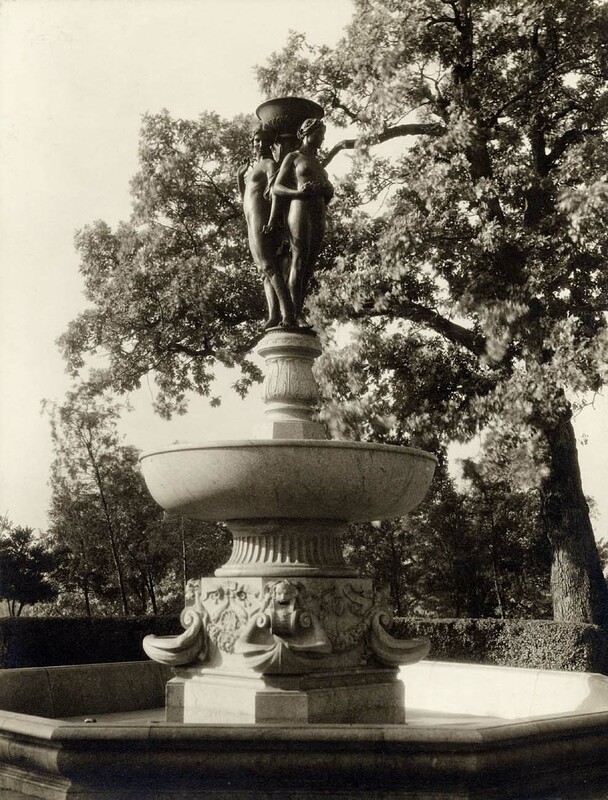 Back in 2011, we wrote about the McMillan Fountain, and how the lower half of the fountain now sits neglected in Fort Washington National Park. 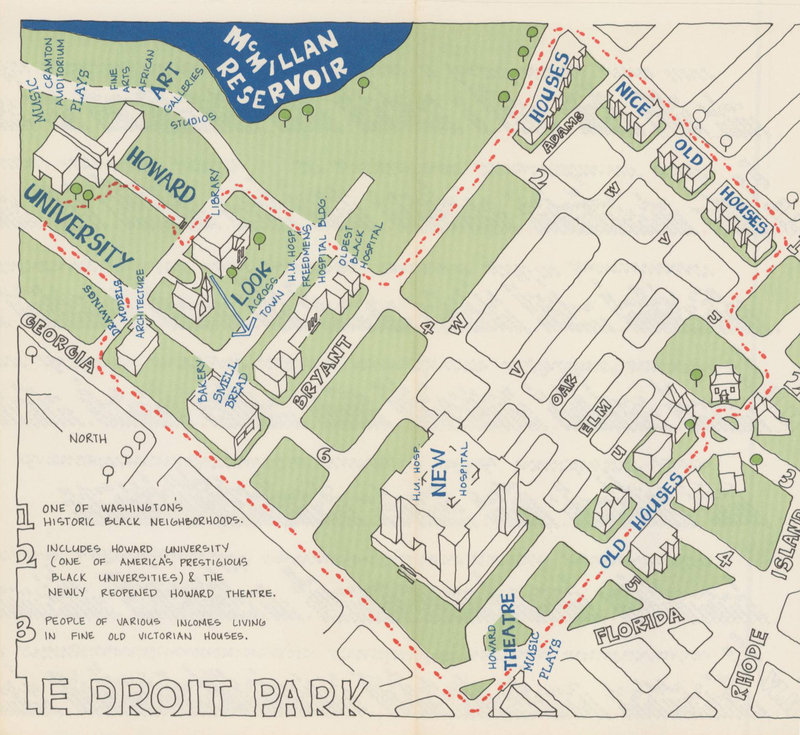 DDOT posted this map of DC published in 1975 to celebrate the bicentennial. The map includes a section on LeDroit Park. Notice the groovy font, the “new” Howard University Hospital, the “nice old houses”, the long-gone bakery, and the “newly reopened Howard Theatre.” The Howard Theatre had briefly reopened from 1975 to 1980. LeDroit Park appears in an online quiz, “How well do you know D.C. neighborhoods?” in the Washington Post. Question 3 asks you to identify the neighborhood known for its Victorian mansions. The answer is LeDroit Park. 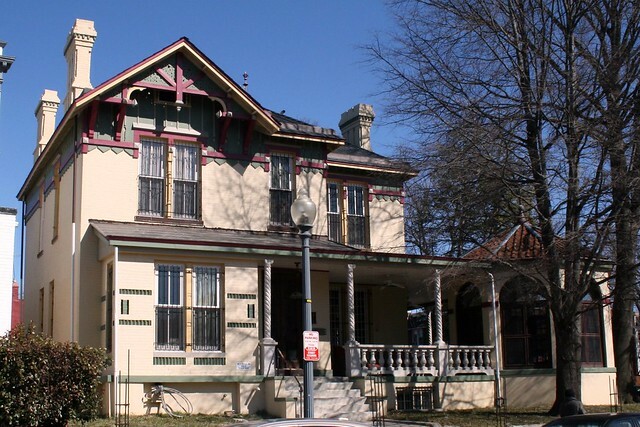 Victorian architecture covers a range of styles, including revival styles, that became popular in the 19th century. What is unusual about LeDroit Park is that it has 12 distinct architectural styles that were popular in the Victorian era. Builders in other neighborhoods typically restricted themselves to a smaller range of styles. A neighbor pointed us to this 1978 article in the Washington Star naming LeDroit Park the neighborhood with the highest annual appreciation in single-family home assessments. Home values increased 51% in just two years. 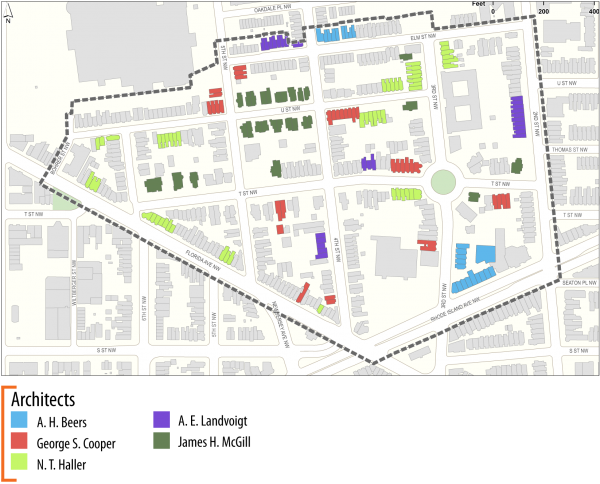 Much of the increase was attributed to Howard University’s purchase of homes in the neighborhood. The university has since divested itself of nearly all single-family houses here. The average neighborhood assessment back then, according to the assessor quoted in the article, was about $25,000. Even in 1978 that was considered low and the figure was about 1.5 times the District’s median household income in 1979, which was $16,211. In 2013 the average sales price of a LeDroit Park home (including condos) was $562,029, which was 9.2 times the District’s median household income in 2013, which was $60,675. The owners of the 1901 4th Street, which currently houses the new LeDroit Park Market, are appealing a denial from the Historic Preservation Review Board (HPRB) to add a roof deck and exterior stair to the building. The owners sought permission to add a 10′-by-14′ deck to the roof of the building, partly hidden by the parapet and gables at the roof’s edge. An exterior stair would be built above the garage, would be visible from 4th Street, and would connect the house to the roof deck. 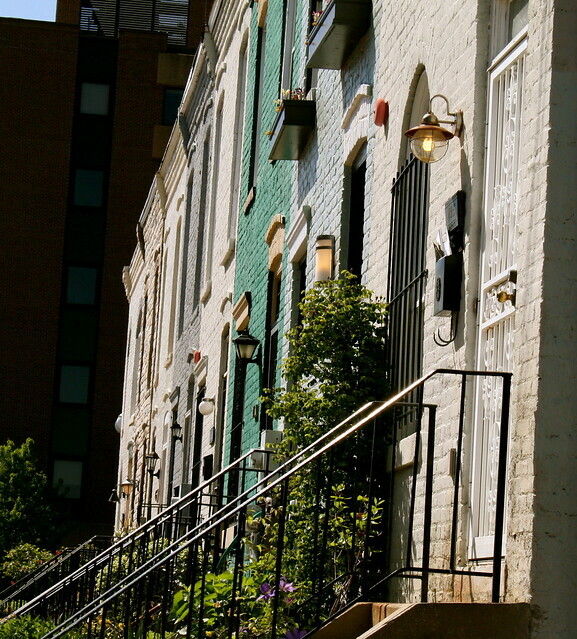 The exterior access stair would be visible from 4th Street and “would create a very prominent and modern intrusion into the character of the historic district.” Furthermore, the stair’s extension to four feet above the height of the roof would “alter the perceived dimensions” of the building and further obstruct the view of neighboring rowhouses. Though roof decks are sometimes permitted when they do not demolish historic features and are not visible from the street, HPO staff worried that this deck, placed close to the building’s edge, “cannot guarantee that the furniture, illumination and activity associated with a roof deck would also not be visible.” Furthermore, HPO staff noted that no contributing buildings in the LeDroit Park Historic District have roof decks (which is not entirely true). If historic preservation rules would place an “unreasonable hardship” on the property owner. If the proposed project is “necessary in the public interest”. Few appeals to the Mayor’s Agent ever succeed and those that do are typically public or public-private projects. In 2009 the Mayor’s Agent permitted the Third Church of Christ, Scientist, to demolish its brutalist sanctuary near the White House since the building’s upkeep was a financial burden to the church. In 2012 the modernization of a historic firehouse in Cleveland Park was deemed “necessary in the public interest” since modern firetrucks required the widening of the historic firehouse’s doors. In 1980 the Mayor’s Agent permitted the demolition of historic buildings to create the original convention center, deeming it a project of “special merit”. The owner’s renovation of this historic property is certainly welcome. However, it is hard to argue that being denied a roof deck is an “unreasonable hardship” or that the construction of a roof deck is “necessary in the public interest” like a firehouse, or that a roof deck will deliver “significant benefits” to DC or the community like a convention center. Nonetheless, the Mayor’s Agent will hold a public hearing on this case on Friday, February 27, 2015, at 9:30 am at the Office of Planning (1100 4th Street SW, Suite E650). Read these details if you wish to testify. On Saturday, Edward Brooke, a LeDroit Park native and the first popularly elected African-American in the U.S. Senate died at age 95. 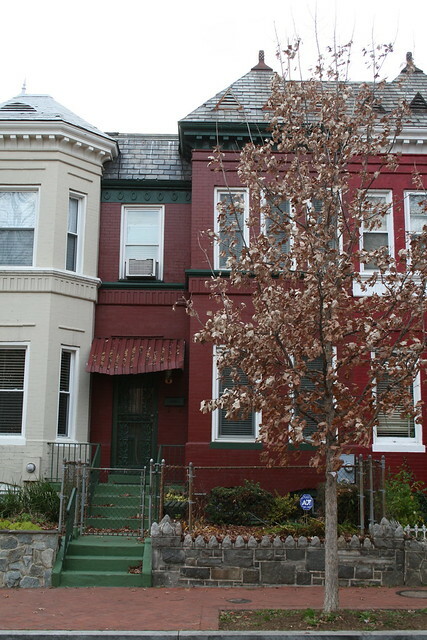 Mr. Brooke grew up at 1938 3rd Street (pictured below) in LeDroit Park, attended Dunbar High School, and graduated from Howard University in 1941. After serving in World War II, in which he was awarded a Bronze Star Medal, he moved to Boston and graduated from Boston University Law School. He practiced law in Boston and ran for office several times, usually as a Republican. The idea of a black New England Republican seems like an impossibility today, but the party was more ideologically diverse in that era and Mr. Brooke was part of its now-extinct liberal wing. Mr. Brooke was elected Attorney General of Massachusetts in 1962 and the state’s voters elected him to represent them in the U.S. Senate in 1966. Mr. Brooke was the first African-American popularly elected to the U.S. Senate. U.S. Senators were typically appointed by state governments until the ratification of the 17th Amendment in 1913. During Reconstruction the Mississippi state government was under Federal control, meaning those in power were Northern newcomers or abolitionist Southerners with liberal views on race relations. Under this short-lived political alignment, the Mississippi legislature appointed two black Republicans to the U.S. Senate, but their terms were short. Pressure from the former Confederate establishment and political intimidation from white supremacist groups ensured that when the Mississippi government was released from Federal control, new legislators quickly put Jim Crow laws into place. No African-American entered the Senate again until Mr. Brooke in 1966. 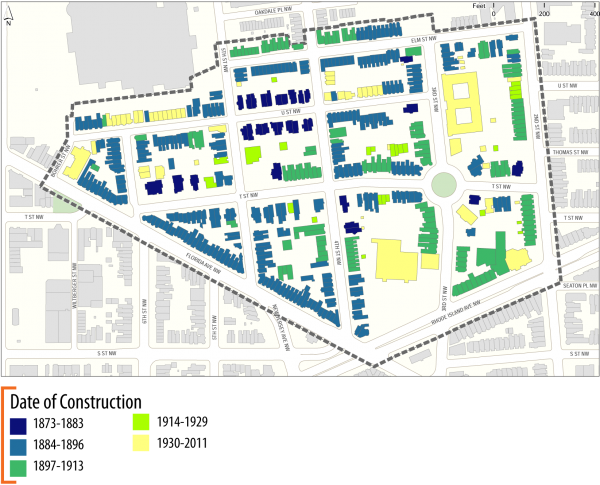 Mr. Brooke’s biggest policy achievements include co-sponsoring the Fair Housing Act of 1968 and the 1969 Housing Act’s so-called Brooke Amendment, which limited public housing rent to 25% of the tenant’s income. In 2004, Pres. Bush awarded Mr. Brooke the Presidential Medal of Freedom and in 2009 Congress awarded Mr. Brooke a Congressional Gold Medal. He died on Saturday at age 95 at his home in Coral Gables, Florida. Below is a photo of his childhood home in LeDroit Park. 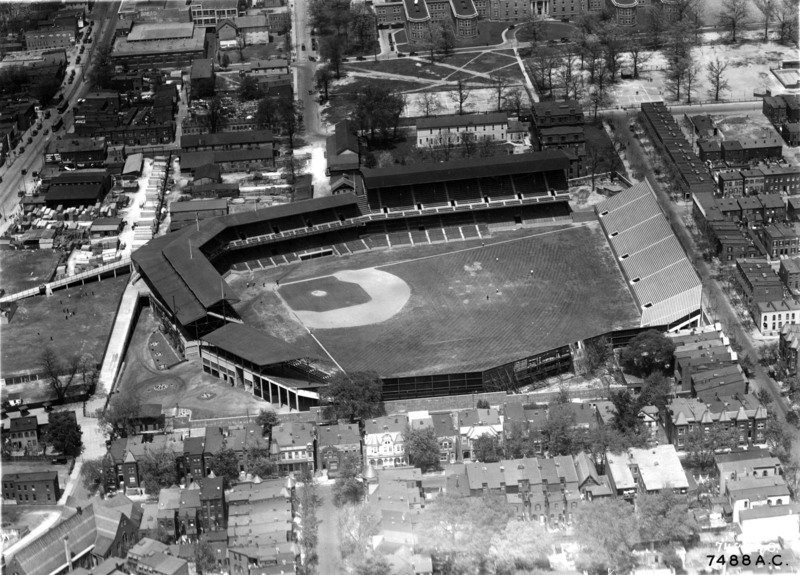 Every time I come across a photo of Griffith Stadium, which stood where Howard University Hospital now stands, I look carefully for an angle of LeDroit Park. By way of Ghosts of DC comes this superb 1925 aerial shot looking north at the stadium and part of the neighborhood. 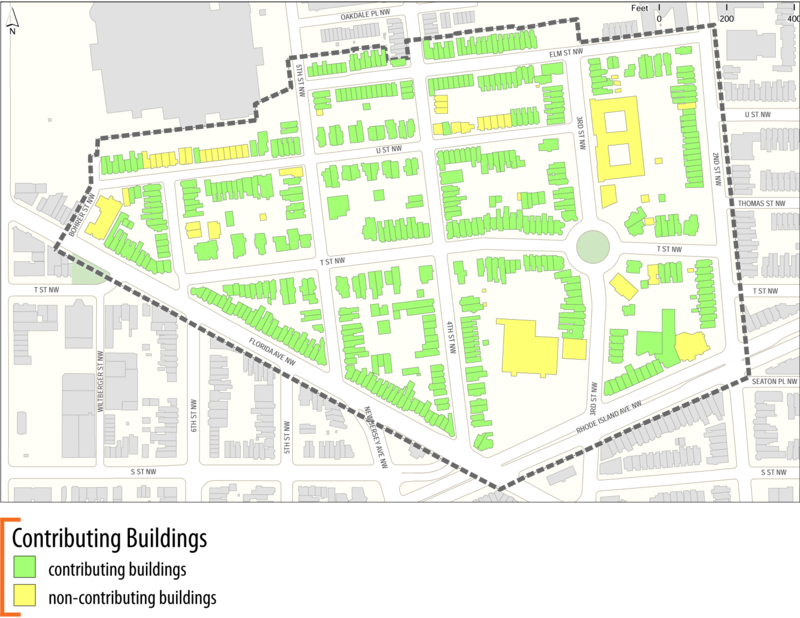 The east-west street in the foreground is the 500 and 600 blocks of U Street NW. Zoom in and look around. Notice the streetcars on Georgia Avenue in the upper-left corner of the photo. Notice the previous incarnation of the Florida Avenue Baptist Church in the lower-left corner. The stands beyond Griffith’s straightaway center field backed up to 5th Street from Elm to V Streets. Can you imagine hearing the crack of a bat and roar of crowds during a Senators game? Also note what’s no longer standing. All but seven houses pictured east and north of the stadium have since been demolished, replaced with parking garages, parking lots, public housing, or academic buildings. 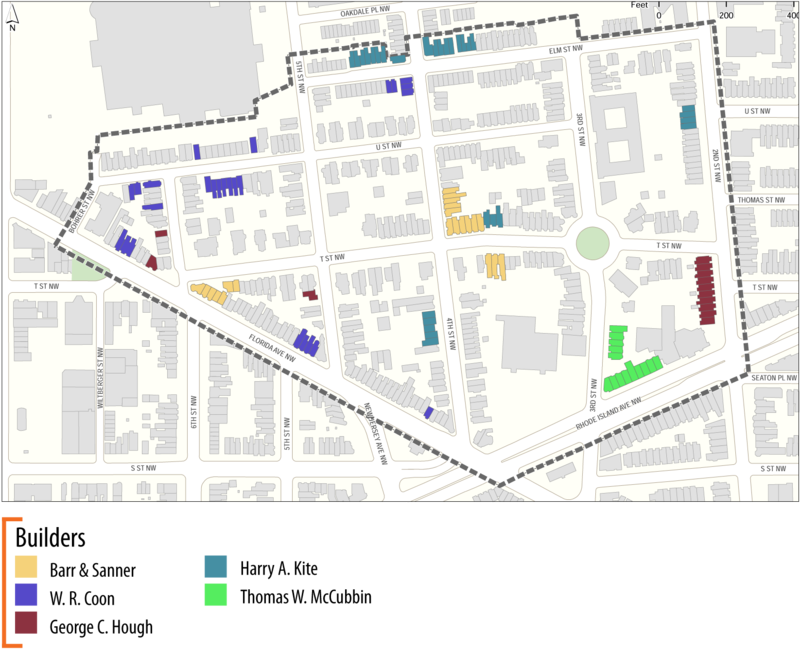 Nearly all of these houses would be illegal to rebuild today under our 1950s zoning code, which mandates minimum lot sizes and house widths to which much of historic LeDroit Park does not conform. We found this 1875 article about LeDroit Park’s fast-growing population from 1875. This was just as the neighborhood was being developed as “suburb” of Washington City. AN INTERESTING ITEM, showing the growth of the city to the north, is the fact that eighteen months ago only two families lived at LeDroit Park, while now more than twenty families make it their residence, and the demand for homes in that beautiful locality is far beyond the supply. Download a PDF of the original story. You can browse the entire Evening Star online with your DC library card.